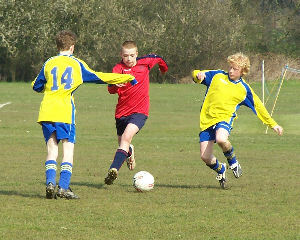 West went out of the Spring Cup at Hadley Rangers as a result of a poor first half which eventually cost them the match. The boys may have approached the game with a little too much confidence following the 4-0 victory away at Hadley at the end of January, as they went behind after just 2 minutes after failing to deal with a cross. West then struggled to get into their usual rhythm, and Hadley created numerous chances which Alex Cobb in goal did well to keep out. Despite creating the odd opportunity, the best of which was a great move between Jamie Heaffey and Greg Springall which ended with Greg’s shot going just wide, West failed to dictate the game. Shortly before half time Hadley grabbed a second, and the half finished with West 2-0 down, having had a very uncharacteristic half against a team they would normally be comfortable against, if on form. Following a good half time team talk from the management team of Alan and John, the boys improved beyond recognition in the second half. They started playing with much more determination, and Greg hit the post early on following one attack. 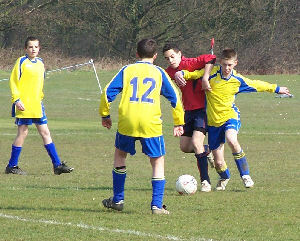 The midfield of Chris Welch, George Figg, Ryan Rickard and Carl Biggs were now dominating play, however Hadley altered their tactics in order to preserve their lead, playing on the counter, with their defence and midfield playing very deep and restricting space for Greg and Jamie up front. This meant scoring opportunities remained limited, and 10 minutes from the end, and totally against the run of play, Hadley grabbed a third following one such counter attack. West didn’t drop their tempo though, and Jamie almost grabbed a goal as one of his shots was cleared off the line, while another hit the post. In the last minute West did grab a consolation goal as Carl hit a superb right footed curler from outside the area that gave the Hadley keeper no chance. The match ended 3-1 to Hadley, however the boys were excellent in the second half as they showed more composure, passed the ball better, and showed much more determination. If they hadn’t had such a poor first half, and one of the shot that hit the woodwork had gone in, it could have been so much different.